Incredibly fast, utilising keyboard shortcuts with the new 'Make-All' interface. Variety of crafting methods to gain xp/make money. Cuts all gems up to dragonstone. Crafts all possible items from different types of leathers. Stops when out of input material(s). Supports possibly all furnaces including Edgeville, Port Phasmatys & Al Kharid as well as any bank for bank-standing. Select the task you want to do in the GUI. Make sure you have the correct mould/chisel/needle & thread in your inventory. If the task you are doing requires a furnace, make sure that you are near the furnace area e.g. 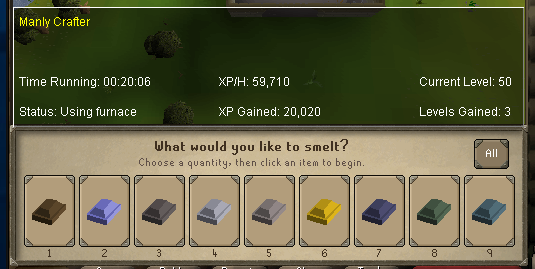 be in edgeville if you are crafting gold bracelets. Then select the location you are at e.g. Edgeville. If the location is not available in the GUI and you are using a furnace, you can select the 'OTHER' option. This will make it unable to walk to the bank/furnace from a very far distance so make sure you start the script nearby. If the task you are completing is at a bank e.g. gem cutting, you can select the 'OTHER' option in the location. Why does the script stop after running for 45-60 minutes? @man16 how do I buy this? Says that no inputs left aka emeralds and gold bars but i had plenty and mold in inventory. Also cant withdraw on it own, so I wrote in 13 and it only then keeps on taking out 13. Could you add progressive mode please? [FINE] Mon Aug 13 13:20:55 AEST 2018: Fine: No inputs left... exiting! stops everytime when my character levels up for some time, is it supposed to do that or is it a bug? What were you crafting? Ill check this today. Can you add port phasmatys support? goes from bank to furnance, crafts all jewellery and runs to different direction. That bank is not supported by the current API. I'll look into it getting added to the API. Edit: @Spencer can comment on it. would it be possible to add charter chip glassblowing? Would have to be a seperate script I'm afraid since the script's framework won't allow me to easily add it since it is an entirely different method. so i'm making emerald rings, after its done the inventory. the script opens this interface(https://i.imgur.com/ryhbv0r.png) every 2-3 runs. i'm not sure why. Checking now... will edit post with result. Edit: It's because there is lag or something on your end. I didn't personally experience this when I just tested it but I increased the sleep amount a little bit so it shouldnt happen. Let me know if it still happens after the update has gone through. I also updated the thread to include this.